One of the biggest school football festivals in the country takes place this week as almost a thousand youngsters from across the district take to the field. The Bradford District Schools 5 v 5 Football Festival celebrates its 20th anniversary this year at the start of a big week for football in the district. The tournament kicks off today at Keighley’s Marley Activities and Coaching Centre. There will be 120 teams of boys and girls between the ages of eight and 14 taking part in the festival. The event, organised by Bradford Council’s Sport & Culture Service is for the first time supported by Bradford based Square Apple Café. Bradford Council’s assistant director of sport and culture Phil Barker said: “Primary and secondary school pupils from all over the district will be taking part in this five-a-side festival and I hope friends and relatives will go along and give them some support. “It is important that young people are provided with enjoyable opportunities to take part in physical activity and sport. All members of the winning and runner-up squads in each of the six age groups ( from under nines up to under 14s) will receive a leather football and commemorative t-shirt respectively. Every participant at the event will also receive an attendance certificate. Joining us this week to talk about the recent School Games Partnership U9 Open Football League Tournament is Jack Summers who organises the event. The start of the 2016/17 competition calendar saw fourteen teams from twelve different Primary Schools in the Hanson Academy Partnership compete in the U9 Open Football League at Goals Soccer Centre, Bradford. The freshly laid pitches at Goals and the bright sunny weather perfectly set up the first round of games. Over the following weeks over 150 boys and girls competed to qualify for the Partnership Finals. However, a big part of our competition relates to the cultural aspects of the School Games so while ultimately the players are committed to winning they are also tasked with displaying one of the six School Games Values. The Value on show for the U9 Football was PASSION. All the teams were a credit to their school and should be extremely proud of their efforts. After two tightly contested leagues five teams qualified for the overall finals. The finals were closer than could have been anticipated with three teams finishing in joint third place. The overall standings were: (1) Thackley Primary School (2) Low Ash Primary School (3) Cavendish Primary School (3) Rainbow Primary School (3) Wellington Primary School. Congratulations and Well Done to Thackley and Low Ash who, as a result of finishing 1st and 2nd respectively, have qualified for the Bradford Summer Games in 2017. To round off what was a fantastic event, the final teams and the Young Ambassadors from Hanson Academy came together for a group photo and even embraced the Dab! Participating Schools: High Crags Academy, St. Francis Catholic Primary School, Killinghall Primary School, Thackley Primary School, Wellington Primary School, Lapage Primary School, Fagley Primary School, Low Ash Primary School (3 teams), Cavendish Primary School, Westbourne Primary School, Westminster Primary School and Rainbow Primary School. Children across the Bradford district are being encouraged to take part in the summer Change4Life 10 Minute Shake-up to make sure they get more active. Last year almost 4,500 families across the Bradford district signed up to take part in the campaign – the second highest figure in Yorkshire. Sign-ups were highest in Eccleshill, Bradford Moor, Tong and Bowling and Barkerend. Just 21% of boys and 16% of girls currently meet the national recommended level of activity of 60 minutes each day and three quarters of children aged five to 11 (75%) want to do more physical activity. The joint Disney, Change4Life and the Amateur Swimming Association (ASA) campaign aims to get more children achieving the recommended 60 minutes of physical activity children need in 10 minute bursts. A recent survey, commissioned by Disney, Change4Life and the ASA revealed 71% of parents say their children would likely be more physically active if they were more active themselves. Swimming was found to be one of children’s favourite activities during the summer, according to 32% of five to 11-year-olds surveyed yet 30% of mums feel too self conscious to go on families swims. The survey also said 61% of parents struggle for ideas on how to keep their children active during the school holidays. Parents looking for ideas can search for change4life on line or visit www.Bradford.gov.uk/summer. “Every 10 minute burst of exercise can make a real difference and helps children get the 60 minutes they need each day. 2016 marks the third year that Change4Life and Disney have come together to inspire children to move more, with fun 10 minute bursts of activity – Shake Ups – inspired by some of Disney’s most recognisable and popular characters. This year, Bowling Park Primary have been trialling a brand new sport called ‘New Age Kurling’. This exciting new game is an adaption of the original curling sport, but can be played on any flat surface, such as a school sports hall, playground or field, instead of the usual ice. This makes the sport more accessible for both able-bodied and disabled people. The school tested the game with Year 3 and 4, helping to develop new skills and giving the children the chance to experience a new sport. The year groups loved the sport so much that they created a team and entered a Bradford Kurling competition, where they were thrilled to come 4th! 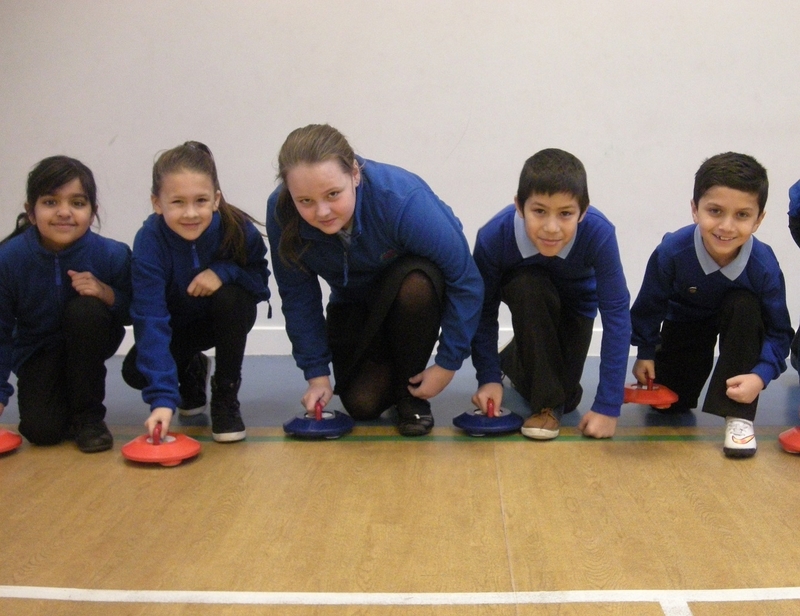 The sport is now being promoted across the whole school and they are hoping to achieve even more success as ‘New Age Kurling’ increases in popularity. 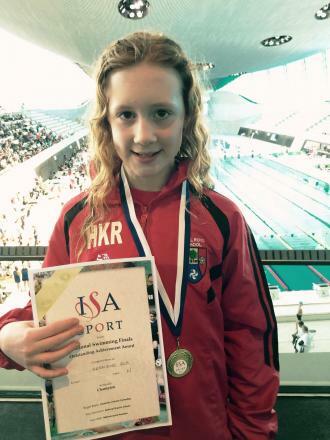 A Year 5 pupil from Ghyll Royd School has scooped gold at the 2015 ISA Schools national swimming final in London at the Olympic Park. Hermione Roe, who was representing Ghyll Royd and the North of England ISA team, swam an impressive individual 50m breaststroke to take first place. Hermione’s performance also saw her beat her personal best in an amazing 44.73 seconds, a time that secures her the number one position in the ASA Great British rankings. Hermione also swam the anchor leg of the 4x50m relay, pulling the team back three places to secure bronze, narrowly missing silver by 0.2 of a second. David Martin, the head teacher of the school in Burley-in-Wharfedale, said: “Many congratulations to Hermione.